Oaks Bottom Wildlife Refuge is a 141-acre park located in a floodplain of the Willamette River very close to downtown Portland. It's an easily accessible place to enjoy a hike or run in a pristine wilderness area. The main trail is only about a mile, but it's possible to link up with a loop and get in 3 miles. 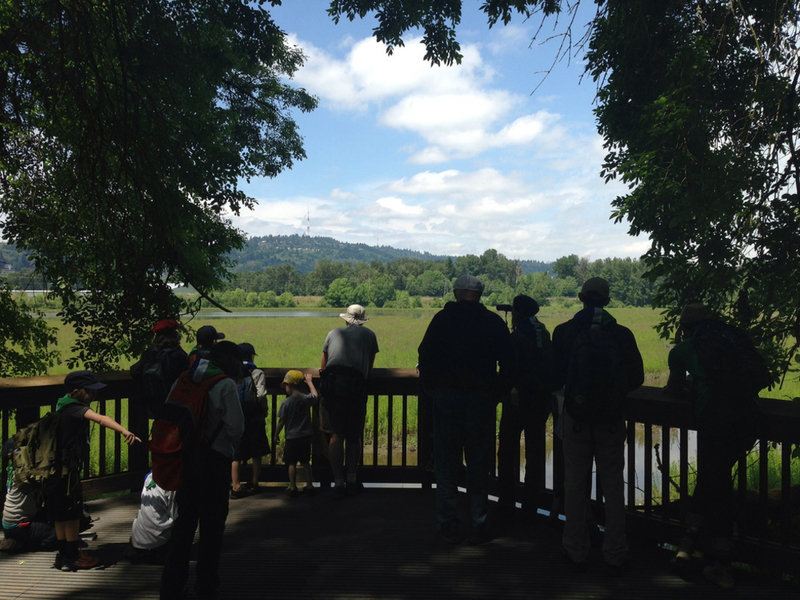 Oaks Bottom Wildlife Refuge and park is a great place to go for a quick hike or trail run close to the city center. It's located in the Sellwood neighborhood, which is only a 15 minute drive from downtown. Alternatively, you can bike or run there from downtown because it borders the Springwater Corridor (it is near the 2.5 mile marker on the corridor). Oaks Bottom has a huge wetland/pond area and there's a twisty and somewhat hilly trail that runs along the east side of the pond, which is only about a mile long, but you can loop back around on the corridor to create a longer 3 mile run. Expect to see lots of animals and birds because it is a wildlife refuge, after all! 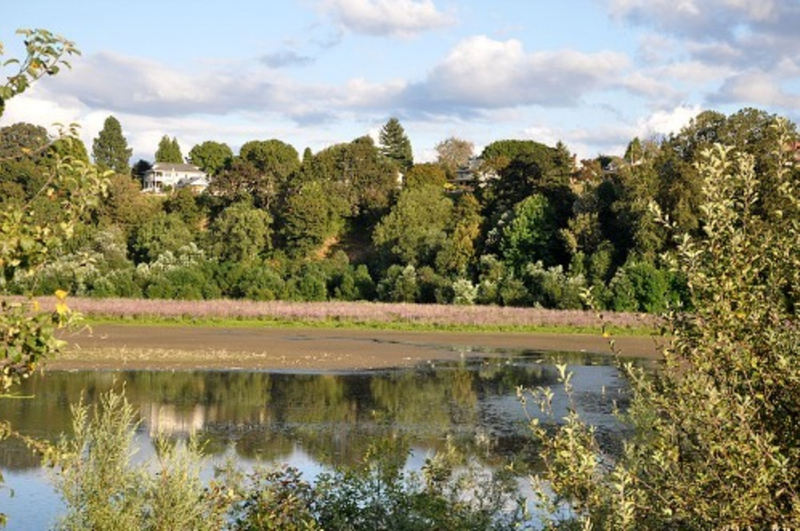 The Oaks Bottom Wildlife Refuge is a floodplain wetland and part of it is built on a sanitation landfill that was acquired by the City of Portland in 1969 to prevent it from becoming an industrial park. As you enjoy Oaks Bottom, let it remind you how the city of Portland takes green space very seriously and makes sacrifices to maintain and create them. We live in a very cool city. There is much wildlife to be observed here - from water birds, particularly in the spring and fall, to beavers and nutria. The water birds here are numerous and include mallards, buffleheads, pintails, wigeons, and even blue herons. Along the trail, you will pass views of our beautiful downtown area and will be surrounded by wildflowers in the spring. This area is truly beautiful, no matter the season. If you would like to start at the Sellwood Park Trailhead, the trail leads down near the informational signs. At the South Meadow Trail, go right, which will allow you to cut through the meadow and Wapato Marsh. In the winter, you will be able to see the mural on the wall of the Portland Memorial Mausoleum, which happens to be the biggest mural in the country. You will pass a junction to a cutoff trail, but continue on to the junction with a bike trail that comes down from Milwaukie Avenue and take a left. This will lead to Tadpole Pond, which contains both salamanders and frogs. Continue on the trail under the railroad to the Springwater Corridor. Just past the 3-mile marker, you will reach a junction that will take you off the corridor to the right, then turn left to pick up the South Meadow Trail past the underpass under the railroad. You will reach another junction, which you should keep right at, then head uphill from the stone steps back up to Sellwood Park. This trail has a mild grade and is only 2.3 miles, so anyone from a trail runner with limited time to a family with small children will enjoy it. The fact that it is a wildlife refuge makes it even more appealing, as you can observe the animals that inhabit this area naturally. From downtown, take highway 43 south to the Sellwood Bridge, turn left and drive .5 miles to SE 7th Ave. Drive another .3 miles and turn left into the parking area.